South Korea’s securities brokerage houses reported a combined 2.7 trillion won ($2.4 billion) in net profit in the first half of this year, up 40.7 percent on-year, preliminary data showed Monday. This marked the highest half-year volume since the first half of 2007, according to data compiled by the Financial Supervisory Service. 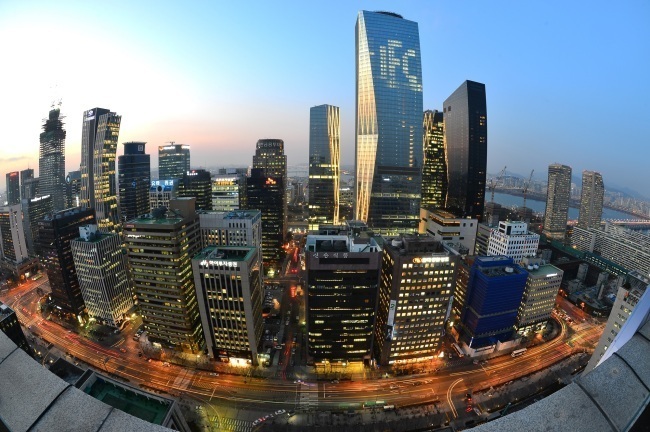 The FSS is an oversight body of 55 securities trading companies in Korea. Meanwhile, the companies saw leverage ratio rise and financial stability decline through the second quarter, data also showed. The surge in income largely stemmed from increased commissions, which jumped 30 percent compared to a year prior, more than offsetting losses from proprietary trading. The total operating revenue jumped 21.5 percent in the first half of 2018 on-year, dwarfing an increase in expenditures for sales and administration by 10.4 percent. Revenues from brokerage commissions soared 45 percent in the first half on-year to 2.7 trillion won. Commissions from investment banking -- including commission from brokering merger or acquisition of companies -- saw a 25.6 percent on-quarter rise as of the second quarter, but the total income in the first half this year saw 1.9 percent fall compared to the first half of 2017. Of all operating income, brokerage commissions and commissions from investment banking took up 35.4 percent and 10.8 percent in the first half, respectively. The companies saw a combined 512.7 billion won loss in derivatives-related proprietary trading, while net revenue from stock-related trading shrank by 68.6 percent on-year. On the other hand, the average of securities brokerage houses’ net capital ratio fell on-quarter by 30 percentage points to 552.9 percent from April to June. The estimate was based on consolidated financial statements of 25 companies and individual statements of 30 firms. The level of decline was particularly sharp among those holding over 1 trillion won in net capital. The 12 firms’ average saw a 77.4 percentage point drop to 998 percent. Under the Korean rules, a firm’s net capital ratio equals net operational capital minus gross risk divided by 70 percent of the sum of minimum equity capital for each authorized business unit. A securities firm is subject to a corrective order if the ratio falls below 100 percent. Also from April to June, the 55 firms’ combined total assets grew 5.5 percent to 447.6 trillion won, while the total liabilities rose 6 percent to 392.7 trillion won. Korean securities firms’ leverage ratio for three months rose 24.9 percentage points to 685.3 percent as of end-June. The extent of the leverage ratio increase was steeper among companies holding less than 1 trillion won in net capital, as the 12 firms with over 1 trillion won net capital saw a 23.1 percentage point rise over the course of three months.